Everyone can use socks right? 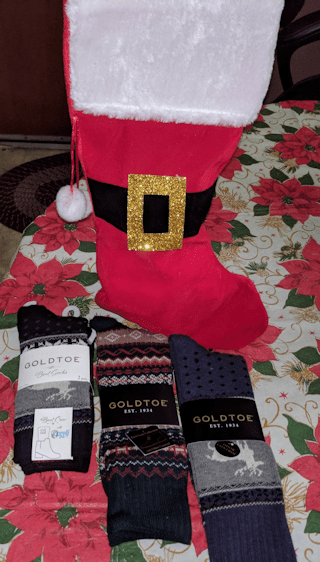 Gold Toe Socks carries an assortment of styles fit for everyone. Socks are the ultimate stocking-stuffer this holiday season. Whether your preference is the cozy crochet-lined boot socks, classic over-the-knee styles or holiday prints with a nod to sweater season. Gold Toe also carries a variety of holiday boot socks ideal for revamping every woman’s winter wardrobe. Featuring Ultra Soft festive styles with snowflakes and reindeer, this year’s Holiday Collection also includes holiday packaging for easy gifting! These socks make a great idea for stocking stuffers for any ladies on your holiday shopping list.